Unit consisting of a base and a rod; it supports various laboratory apparatuses such as burettes and flasks. Heavy metal pedestal supporting the rod. 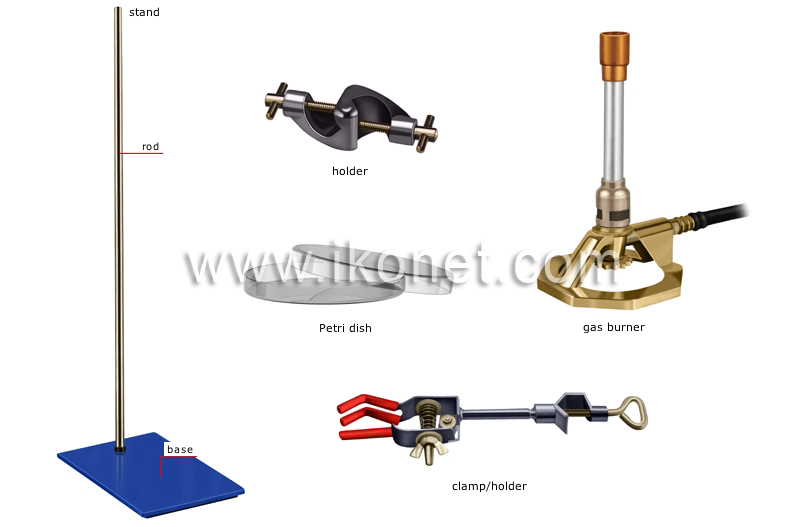 Long metal part to which various laboratory devices can be clamped. Flat transparent box for culturing microorganisms; it has a cover to protect them from contamination. Part with a screw for attaching a clamp onto the stand’s rod. Part attached to the stand’s rod by a holder and having tongs that clamp onto the laboratory equipment to hold it in place. Device that is fueled by gas to produce a flame for heating chemical products.